Mirza Hussain, and other prisoners like him, had labored for hours to stack mines, bombs and dynamite beneath the feet of Afghanistan's most iconic public artwork — a 175-foot standing statue of the Buddha carved from the sandstone cliffs of the Bamiyan Valley sometime in the 7th century. Finally, the local Taliban commander blew his whistle, and hundreds of observers plugged their ears, held their breath and waited for the Buddha to fall. It didn't. The first load of explosives only destroyed the statue's feet. "They were disappointed," says Hussain, of the Taliban leaders who had decreed in March of 2001 that the famous Buddhist monument was idolatrous, and would be demolished. Initially, Taliban fighters had fired at the Buddha with assault rifles, stinger missiles and RPGs, to little effect. When the stacked explosives at the statue's base failed, Hussain and other prisoners were dangled over the edge of the cliffs to stuff dynamite into holes in the soft stone. "Our soldiers are working hard to demolish the remaining parts," announced Mawlawi Qudratullah Jamal, the Taliban's minister of information and culture, at a press conference in Kabul a day later. "It is easier to destroy than to build." He was right. Within days the Taliban had all but decimated the remains of a magnificent Buddhist civilization that had for six centuries ruled this strategic valley at the crossroads of Central Asian trade. 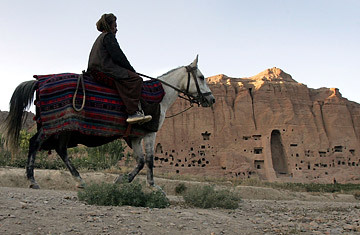 They rampaged through the caves that honeycomb Bamiyan's cliffs, smashing thousands of smaller Buddha sculptures. They chiseled intricate frescoes from the walls, and where they weren't able to tear off the plaster, they gouged out the eyes and hands of those depicted. Locals say the figures in the images bore facial features typical of the Hazara, the persecuted Shi'ite minority group that populates the province. The Taliban massacred hundreds of Hazaras when they took control of Afghanistan; many in the valley believe that the destruction of the Buddhas was an extension of their genocidal campaign. "The Buddhas had eyes like ours, and the Taliban destroyed them like they tried to destroy us," says Marzia Mohammadi, a midwife. "They wanted to kill our culture, erase us from this valley." Seven years on, archaeologists and volunteers from around the world are doing what they can to put the symbols of Bamiyan's Buddhist legacy back together again. Piles of shattered rock lie stacked under shelters of corrugated iron and plastic sheeting where the Buddhas once stood. Under debate, right now, is the question of how and whether the statues should be rebuilt. Little remains of the stucco coat and sculpted stone that gave the Buddhas of Bamiyan their definition. Putting them back together again would be akin to piecing together a puzzle of a million pieces — but without the benefit of an image printed on the box top. Nevertheless, Habiba Sarabi, Bamiyan's governor, believes rebuilding the Buddhas is important for the psychic well-being of her province. "The Buddhas were a part of the life of people in Bamiyan," she says. "Now the empty niches of the Buddhas affect the landscape, so the people share the sorrow." In a process called anastylosis, original fragments of damaged statuary can be pieced together with cement or other materials — as has been done at Cambodia's ancient Angkor Wat temple complex. But if less than half of the original material remains, says restoration experts, the new structure loses its historical value, and should be considered a replica. And being rebuilt as a replica could put the World Heritage Site status of the Bamiyan Buddhas at risk. Archaeologists have estimated that about 50% of the original stone remains, but a full study has yet to be completed. Abdul Ahad Abassy, head of Afghanistan's Preservation and Restoration of Historical Monuments department, sees a pattern in the Taliban's efforts to take down the Buddhas. One of Afghanistan's early Islamic kings tore through the caves in the 11th century, smashing idols as he went. And at the end of the 19th century the mother of then King Abdul Rahman had cannons fired at the standing Buddhas. Afghan history, he says, is filled with characters who attempt to erase the past. They, too, are part of Afghanistan's heritage — a heritage that it is his job to preserve. So, Bamiyan's Buddhas present a conundrum. Brutal though it may have been, the Taliban legacy is an important part of Afghanistan's recent past. The empty niches of Bamiyan are testament to a ruthlessness that should not be forgotten — rebuilding the Buddhas would be a kind of erasure. "The present condition of the buddhas is in itself an expression of our history," says Abassy. "No matter how good or bad the Taliban were, we cannot tear that page from the book." Governor Sorabi sees a Solomonic compromise that both respects Afghanistan's recent history while celebrating its ancient culture. "We have many empty niches to be reminders of the dark parts of our history," she says. "If we rebuild one Buddha, we can leave the other as it is."